Is Preschool Bullying a Problem in Your School? Bullying behavior has been shown to begin as early as 3 years old in girls and boys. Is bullying a problem at your pre-school and are you prepared to handle it? The Respect U Pre-School Program is designed for the emotional and social foundation building skills young children need to reduce bullying behaviors in the classroom and prevent poor behavior from emerging. Consistency with bully prevention methods that are applied at the pre-school level yield long-lasting results. Dr. Joel Haber, offers speaking engagements and half-day or full training programs that introduce all staff to important anti-bullying concepts and strategies that work for young children. This training is designed for principals, teachers, support staff, as well as community partners and parents. The program is customized for your specific school and focuses on what methods teachers need to utilize in their classrooms to foster pro-social behavior and reduce beginning bullying behaviors. Dr. Haber will also intervene in particular cases of youth bullying if necessary. 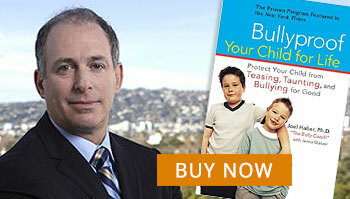 Dr. Joel Haber provides the help you need to focus your efforts to prevent and reduce bullying in the pre-school years. I’ll show you how to maximize the time spent on bullying efforts and create a place children and parents can feel safe away from bullying concerns. I offer crisis management services for administrators, parents, school counselors or a combination for a specific incident. These anti-bullying coaching services help you manage a bully concern by providing the right language and skills to manage or resolve a bully situation. Please contact us for details and pricing for this option. Preschool bullying, if caught early in a child’s development can be resolved. To learn more about bullying at the elementary, middle and high school levels, click here.